Rhubarb is my new favorite food. Where-oh-where have you been all my life? I LOVE this stuff. Before last week, I’d never made anything out of rhubarb, other than maybe a few sugar-stalk treats as a kid. You know, when you take a fresh piece of rhubarb and dip it in the sugar bowl with each bite. Nothing like white table sugar to take the edge off the tartness. And later your mom would ask why the sugar was so gummy. Duh, I don’t know. I belong to the Grant Family Farm CSA and fresh rhubarb was in last week’s delivery box. Along with a bunch of other amazing, early-summer goodies like garlic scapes, celery, a variety of greens, radishes, and onions. I had to figure out what to do with the rhubarb and the garlic scapes, which are interesting and delightful little chlorophyl-green, curly-cue tendrils. That’s what I love about belonging to a CSA. You don’t get to pick and choose according to your produce comfort level. You get what is seasonally fresh, whether you’re familiar with it or not. It’s fun to experiment. And eating a wide variety of fresh fruits and vegetables is the foundation for a healthy diet. When you incorporate all kinds of fresh (local and organic) food into your diet, you end up eating a wide spectrum of phytonutrients, carotenoids, and health-promoting vitamins and minerals. You get the best nature has to offer if you eat seasonal foods. Your body will thank you. Listen carefully! Because of its rich concentration of beta-carotene, cantaloupe is an excellent source of vitamin A. As an aside, some people with celiac disease complain of night blindness, most likely as a result of fat malabsorption. When you have intestinal damage and don’t properly break-down and absorb fats, the result is often an inability to utilize fat-soluble vitamins (A, D, E, and K). If you are unable to assimilate the vitamin A you consume, you may end up with night-vision problems. Yep, that’s me! I feel like I have on very dark sunglasses when I’m driving at night. It’s a total bother, but now that I’ve been gluten-free for so long and feel that I’m on the mend, I make sure to eat LOTS of fruits and veggies that are high in beta-carotene. Studies have shown that a diet high in beta-carotene reduces the risk of other eye-related disorders like cataracts and macular degeneration. Cantaloupe is also high in vitamin C, which aids in boosting immune function and helps reduce the risk of heart disease. Good stuff, for sure! These orange veggies of June are also packed with beta-carotene. In fact, carrots are at the top of the list, providing one of the richest sources available. Your mom was right when she bugged you about eating carrots for better vision. One cup of carrots provides about 680% of the daily value for vitamin A. Wow, so she knew what she was talking about, as mom’s usually do. Well, sometimes we do. Tip: Cut off the leafy, green tops before you store a bunch of carrots. The tops draw moisture from the root (the carrot) and causes them to wilt sooner. According to the Department of Horticulture at Cornell University, raspberries are considered the symbol of kindness in Christian art. The red juice of the berry represents blood flowing from the heart, which is thought of as the center of love and kindness. (Although I think it should be the liver, but I’ll save that digression for another post.) Greek mythology suggests raspberries got their red color from the blood of Ida, a goddess who pricked her finger while collecting the berries. The Latin name for raspberry is Rubus idaeus, which means “bramble bush of Ida.” Interesting little tid-bits, wouldn’t you agree? I guess this love affair with rhubarb is nothing new. 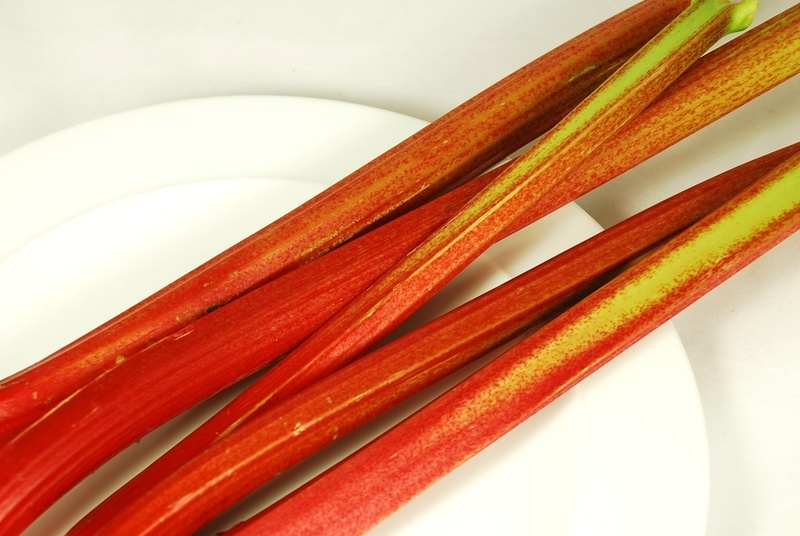 Early records date back to 2700 BC where rhubarb was used by Chinese emperors for medicinal purposes. Wow, and I thought it was something I discovered. If nothing else, I did discover a new gluten-free treat that tastes wonderful, and once again, reminds me that adhering to a gluten-free diet is really no big deal. The fact that rhubarb is considered a medicinal plant is just crumble on the pie. Since I know very little about rhubarb, I’ll lift some fun information from Wikipedia, rather than focus on the health benefits. I’ll just trust those ancient Chinese emperors, although I do know from preparing and cooking with it, that rhubarb has lots of fiber. Again, trust me, that’s a good thing. Do you remember the Michael Keaton version of the movie Batman? Leave it to Jack Nicholson (the Joker) to turn rhubarb into a risque word. He warns Batman to “never rub another man’s rhubarb.” Huh? Sounds rather suggestive, but it was actually meant as an admonition to leave his love interest (Vicky Vale, aka Kim Basinger) alone. So, rhubarb means a sweet, louscious little tart? I guess so, and here’s my rendition. Serve warm and bubbly topped with vanilla ice cream. YUM! * I know, I know — lots of sugar. Just remember, sugar is not inherently evil, we just eat WAY too much of it. This is a treat, so go easy on it and don’t make a habit of it. I say that as I make my 2nd batch of this in a week. Hey, I have to use all the rhubarb Josh and Susan from Grant Family Farms forced on me. It’s not my fault. Plus, I had to perfect the recipe before passing it along to you. It took a couple of tries to get it right. * Don’t eat the leaves of the rhubarb, just the stalks. The leaves have some potentially toxic substances. This entry was posted on Wednesday, June 25th, 2008 at 10:08 am	and is filed under Celiac & Gluten Intolerance, Gluten-Free Recipes, Nutrition Therapy, Seasonal Foods. You can follow any responses to this entry through the RSS 2.0 feed. You can leave a response, or trackback from your own site. Just found your blog via Kalyn’s Kitchen. We are fairly new to gluten free living having been at it for just a couple months! Your Straw/Rhu recipe looks good! Haven’t had that for years! that was a funny comment you left about my sleeping beauty cake!! Totally true! But seriously..everything else on my blog int “fancy schmancy”!! !Ok that was my ONE exception! !Thanks for visiting, COME BACK ANYTIME! Welcome to GF living, Paula. You’ll find there is an amazing abundance of good food in this little world of ours! No problem! Hey Leslie — yes, that cake of yours looked pretty intense for a girl who professes to be fuss-free in the kitchen! Tiffany — HOW are you, girl? I’ve been out of touch too long. Yes, rhubarb is my new favorite! Hmm (again that hmm). Let me think of lower g.i. swaps for the sugar topping before I try this. I agree about your sugar comment, HFCS is certainly the overbearing evil lurking in well… everything. Anyways enough blabbering, thanks for the seasonal food post- I always look forward to them! Another informative post, Melissa! I am totally making the rhubarb dish for the Fourth. Thanks for all the great info! Dhanggit — Rhubarb trendy? I had no idea. That makes it all the more fun. Cindy LOU! SO good to hear from you. How’s married life? I’ve missed you too. I guess we’ve both been on a hiatus of sorts. I’ve been totally out of the blogging loop lately, but I’m back! You’re completely right about the sugar and I don’t normally recommend recipes with this much sugar, but once every so often, I go for it. I might try it with agave next time and see how that works. If you come up with an alternative, let me know. Lizzie — let me know how it comes out. I never know if I explain things well or not. I have never tried rhubarb before. How sad is that? I guess I need to get on the ball and give it a try. Your recipe sounds fantastic! I too am a member of the rhubarb-worshipping cult, in fact I have a nice rhubarb and apple compote in the fridge to eat with my morning cereal at the moment. But my favourite is to fry it! Gluten-free and delcious I can promise you. Hi Bridgett — yes, give it a go! Rhubarb is the new wheat germ. Yum! AOF — fried rhubarb? I never would have guessed, but I checked out your link and it does sound interesting. Especially the ginger part. Hmmm, I have rhubarb and I have ginger. I’ll give it a try. I’m totally addicted to the stuff, but need to find new ways of eating it other than cobbler. Thanks for the tip. I saw your recipe on The Good Eatah and came to check out your blog. I’ll try your strawberry rhubarb recipe right away! And I’ve added you to my “Great blogs!” blogroll. Hope that’s okay with you. Thanks for adding some science to our continuing pursuit of good health! Lizzie – yes, and it’s foolproof. Aaahhh, thank you for adopting me. You’re such a sweet girl! Kay – thank you for adding me to your blogroll. I’ll do the same. Yum, I am a big rubbarb fan myself. Hi Melissa- I’ve been away for awhile. Love your new site, it is fabulous. Just visited with my daughter who lives in Alaska. She brought me 10 lbs of rhubarb from her garden, via airplace with toddler in tow. Great recipe.